Recently WhatsApp has launched the ‘Dismiss as Admin’ feature options for their iOS and Web App users. Using this feature, any member can delete a specific group member as an admin of the group. The use of this feature will stop other group admin member to behave like a junk Group Administrator. This means that if you are an admin of any group, then you can remove the other group admin from an admin term without deleting him from the group. However, this feature is currently launched only for iOS (Apple devices) and WhatsApp web. Apple Mobile User must have WhatsApp 2.18.41 version to available this “Dismiss as Admin” feature. The feature is not currently unavailable for Android smart phone users. To access the iOS user “Dismiss as Admin” feature, open the group, click on Group Info. If you select the group admin then you will see an option to dismiss. Android users do not need to be disappointed because Whatsapp is developing ‘high priority notifications’ feature for Android users. This feature will be applicable in WhatsApp group chat. According to WABetaInfo, using the “High Priority Notification” feature the user can pin a particular notification to the Smartphone notification center. Especially this feature will be useful for people who are members of any office group. If there is any special notification in the office group, users will be able to pin it through this feature to remember it. To use this feature android user must have Whatsapp 2.18.116 version. According to WABetaInfo, currently this feature has been activated only for Whatsapp beta users. 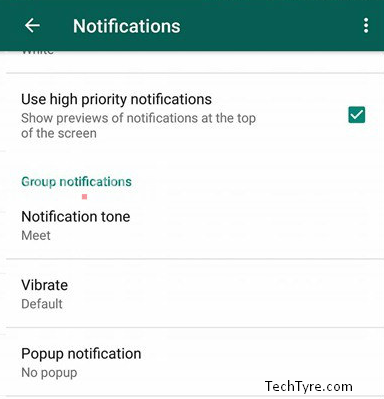 To activate this feature user will have to go notification setting in particular group. Here, user must have to tick on “Use high priority notifications”. By doing this user will see a preview on top screen.